Mary Moody was one of the first female physicians in New Haven, rejecting Victorian mores that dictated a married woman with children not seek a career outside the home. She was the first female graduate of the medical school at the University of Buffalo, the first female member of the American Association of Anatomists, and an advocate for the health of women and children throughout her career. She spent most of her working life in New Haven, initially practicing out of offices downtown. During the prime of her career, from 1890 to 1903, she used her home in Fair Haven Heights as her medical office. Moody also made house calls to her patients in a horse-drawn buggy. An illustration of Mary Blair Moody from American Women: Fifteen Hundred Biographies with over 1,400 Portraits…, Vol. II edited by Frances Elizabeth Willard and Mary A. Livermore, ca. 1897. 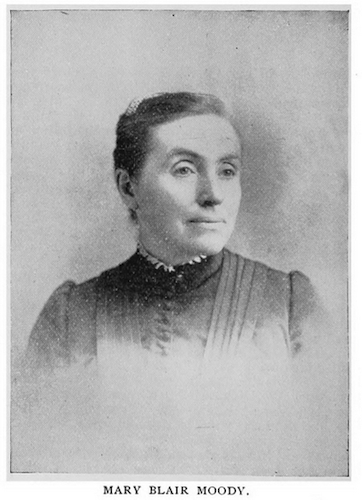 In 1874, Mary Moody became the first female student at the School of Medicine at the University of Buffalo, now the State University of New York at Buffalo. The professors at the university generally treated her well, although it was made clear to her that “it shall never be a woman’s college. If they wish to study as the men do, well and good.” One particularly reticent faculty member told Moody, “No lady will wish to study medicine.” [emphasis added]. His implication that Moody was deficient or bizarre did not deter Moody from earning her degree. Victorian-era women seeking to become doctors were limited to a few coeducational medical schools and some medical schools dedicated strictly to the education of female physicians; but female-centric medical schools were viewed as suspect and irregular in their teaching, thus placing their graduates at a disadvantage. Female physicians also were denied clinical training as interns by hospitals, which curtailed their ability to obtain licenses to practice. Despite these hardships, 2,432 female doctors practiced in the United States by 1880. Moody graduated from medical school in 1876 and worked as a physician in Buffalo for approximately nine years. While in Buffalo, she advocated for preventative medicine, lectured at the Women’s Gymnasium, and participated in the establishment of the Dispensary for Women and Children. The Moody family then moved to New Haven, where Lucius Moody established the Connecticut office of a national life insurance company. Dr. Moody quickly established herself as a physician in New Haven, one of a handful of active female physicians in the city. She maintained memberships in the Connecticut Medical Society, the National Medical Association, the American Microscopical Association, and the American Association of Anatomists. Listing for Dr. Mary Blair Moody in Price & Leeʹs New Haven City Directory, 1900. Dr. Moody also was active in several local social health organizations. She was on the board of the Calvary Industrial Home, which provided shelter for homeless men, and president of the Women’s Auxiliary of the Mt. Carmel Children’s Home and of the local chapter of the Women’s Christian Temperance Union. The house where Moody lived on Grand Avenue in New Haven also is significant. 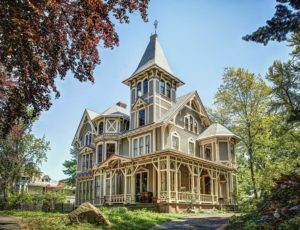 It is an exuberant expression of the Carpenter Gothic style of the late Victorian period and one of the few surviving buildings dating from this period in this section of Fair Haven Heights. The couple lived in the house until Lucius Moody died in 1903. Dr. Moody moved to Pasadena, California, in 1905, likely to be closer to her two sons. 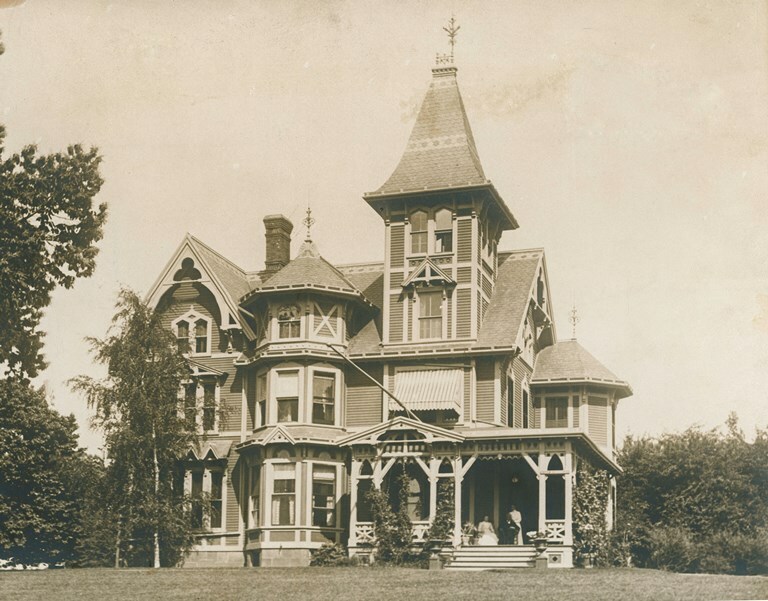 The family retained the New Haven property until 1912, when it was sold and ultimately renamed “Chetstone.” Dr. Moody later returned to Connecticut, residing with her daughter in New Haven until her death in 1919. “PDF - New Haven Preservation Trust, New Haven Historical Resources Inventory, 1981.” CityofNewHaven.com, 2016. Link. Beers, F. W., and A. B. Prindle. “Atlas of New Haven County Connecticut: From Actual Surveys.” New York, NY: Published by F.W. Beers, A.D. Ellis & G.G. Soule, 1868. Kelly, Cassius, ed. Atlas of New Haven, Connecticut. Boston, MA: O. W. Walker, 1911. Moody, M.D., Mary Blair. “College Life for Women Twenty Years Ago.” In Buffalo Medical and Surgical Journal, Vol. 35. Buffalo, NY: Joseph Warren & Co., Printers, 1895. Link. Townshend, Doris B. Fair Haven: A Journey Through Time. New Haven, CT: New Haven Colony Historical Society, 1976. “Lucius W. Moody (Includes Wife Dr. Mary B. Moody).” In Commemorative Biographical Record of New Haven County, Connecticut, Containing Biographical Sketches of Prominent and Representative Citizens and of Many of the Early Settled Families. Chicago, IL: J.H. Beers & Co., 1902. Link. Shumway, Floyd M., Richard Hegel, and New Haven Colony Historical Society. New Haven: An Illustrated History. Woodland Hills, CA: Windsor Publications, 1981.